Having moved to Antwerp in the off-season I now find myself in easier reaching distance of the Kevin Pauwels Supporters base. This means that I get the chance to travel to the races on the supporters bus. YAY! This, of course, will not get you to your destination at the same time the train would have so the question is do you get there early or a little late? I opted for early, which meant getting there one hour before. Luckily, the good people of the Kevin Pauwels Supporters Club know how to treat folk and the pub is open for coffee and mini croissants It is also a great opportunity for everyone to gather and chat. Much talk was had over the first races of the season. 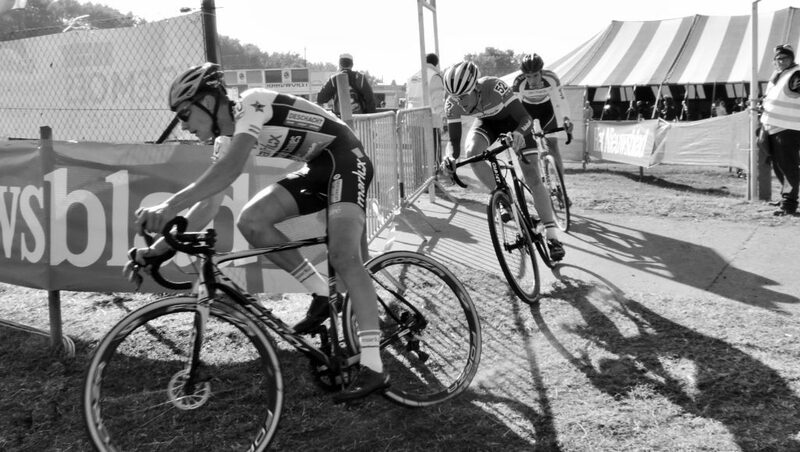 Of course, Kevin has had a rather up and down start with a 12th at CrossVegas but 2nd at JingleCross. 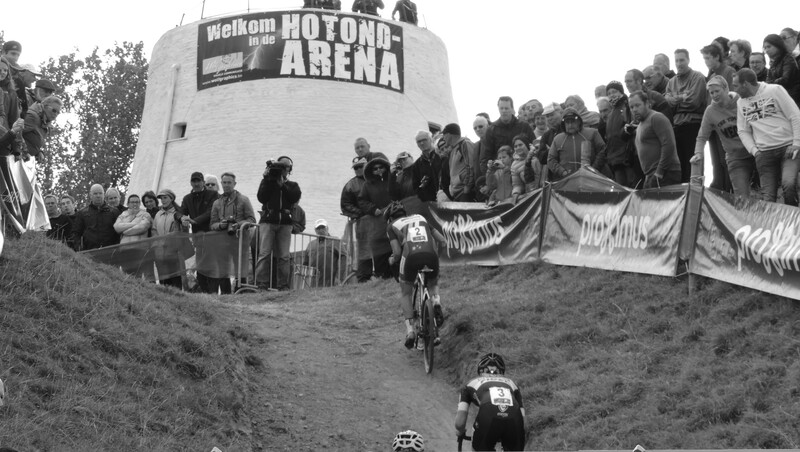 Some people had made it to Gieten last week where Kevin was back to 11th place. There was even talk about Charm City – Yeah, we know a bit about CX over there too! Soon the lovely double decker bus was parked outside and was being stocked up with food and drink and pimped out with Kevin decals in the windows – no traveling incognito for us. In due course, we all got on board and off we went, Ronse bound. During the journey I had thought we might get the ‘Trots op Kevin’ CD, but maybe that is reserved for coming home with a win. We do get our instructions for coming home – If Kevin’s on the podium we leave at 5pm, if not, 4.30pm. The other announcement was that next week at Zonhoven the Elite Men’s Race won’t start until 4.30pm, due to the World Championship in Doha, so we won’t leave for the race until midday. Sadly, this means the Newbies and Juniors will have raced before we get there, but that’s a tale for another day. It would appear that my Dutch is still at the stage where I understand most of the sentences, but I get lost in dialect and my vocabulary is still limited. Oh! To have a young, flexible brain again! Thankfully, there are Cindy and Marc to make sure I get the message. As we get closer to Ronse we can see the other buses and other cars going our way and I am starting to recognize the roads and get a little excited. Before you know it, we’re tussling with the Wout Bus for a parking spot! One thing I hadn’t thought about was a change of shoes, which everyone else was now grabbing from the luggage compartment! Doh! Good job it’s a hot dry day! I must remember that for next time. So, now to walk up the familiar road towards the big striped beer tent. First we are past the Era-Circus team then Beobank-Corendon and the Crelan-Vastgoed Service is just by the Giant vans and then we’re into the Telenet-Fidea line-up and there is a Marlux-Napoleon Games camper following up the road. After it passes we can see it’s the Kevin Kamper (poetic license). Last year I was doing the ‘today’s winner will be the first rider I see’ so, by that theory, it would be a day for Michael Vanthourenhout and Laura Verdonschot! A quick diversion off to where the women’s teams are parked and I spot Maud Kaptheijns heading out to practice and Ceylin Alvardo joined her Kleur Op Maat teammate to get on the course. Finally, I get inside and the U23s are getting ready to go and we get first sight of a rainbow jersey. This one on the shoulders of Eli Iserbyt. 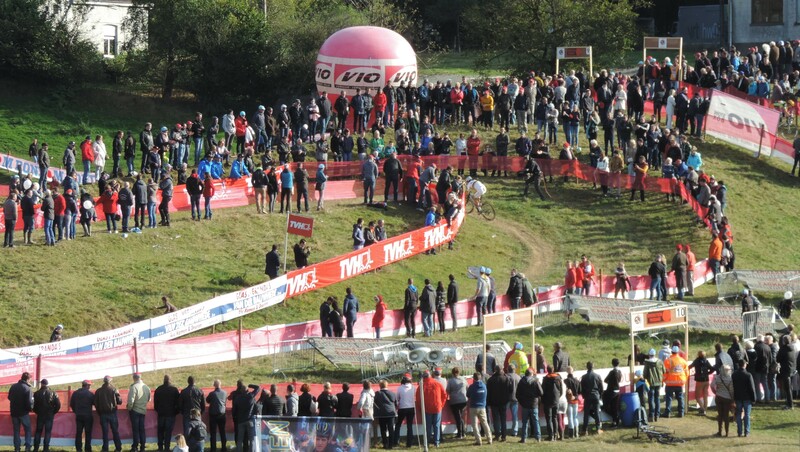 There doesn’t seem to be so many people here today, but hopefully, we are just early as I get to watch Loes Sels practice by the big knotty roots on the final drop before the last corner to the finish line. And, behind Loes, is my second glimpse of rainbows, this time on the back of Thalita de Jong. And then the U23s are off and I’m heading to the top of the run-up for the first couple of laps. 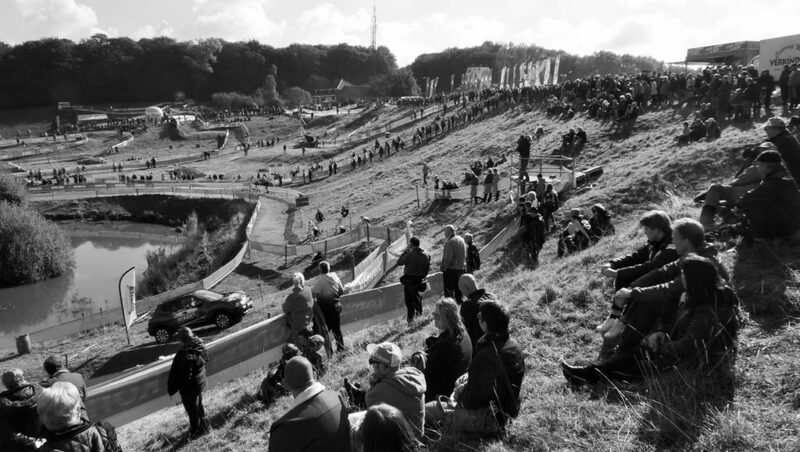 This is one of the reasons I love this course so much – from almost anywhere in the Hotond Arena you get the most fantastic view of the action and it feels like I’m looking down over the whole course as well as the neighbouring towns. It really is special. Today there is a right battle going on up front. This dry dusty arena is proving to be fast and furious and the only 2 to keep it company are Rainbow Eli and young Dutch star Joris Nieuwenhuis (was it Joris who had that calamitous fall in front of the beer tent at Zolder?). The World Champ is expending a lot of energy trying to stamp his authority on the race, but JN is not falling for that and powers away solo. Briefly, Eli takes refuge in the 2nd group on the road alongside Adam Toupalik & young Dutch Champ Sieben Wouters, before trying again, but Joris is over 30 seconds ahead. A very well-deserved win to the young Rabobank rider and a day Euro champ Quinten Hermans and Belgian champ Thijs Aerts might choose to forget. At the end of the U23 race I wander down towards the pits and JACKPOT GPON! Also the men are out practicing and sometime you’d just love to know what they’re all talking about. After the men have all gone back we still have a bit of a wait before the Women’s Race so I find a nice spot on one the banks, drop my jacket on the grass, take a seat and get out my lunch. How good is life to be eating cheese and mayo sarnies on a gorgeously sunny Sunday afternoon with a few thousand others anticipating 2 more exciting CX races? Then the women are lining up. I’m in the middle of the arena and waiting to see who’s first coming in and it’s the Rainbows herself leading from the off. And she’s not messing about. She is on a mission for sure and already the others appear to be fighting for 2nd. By the time they get to the run-up Thalita de Jong is already 50m ahead and it’s Sanne Cant and Lucinda Brand going head to head with Sophie de Boer and Pavla Havlikova chasing them, Ellen van Loy and Maud Kaptheijns complete the front group and Laura Verdonschot has Nikki Harris (Brammeier) pushing her along behind. By lap 2 Elle Anderson is also in the picture behind Nikki and crowd favourite Jolien Verscheuren is being cheered around (I didn’t see why Jolien had such a bad first lap). And then it’s all happening as Lucinda Brand has a problem and Sophie and Pavla take up the front chasers spots. And just when you think Pavla is going to be on the podium 2 years in a row, she too is getting friendly with her chain and it’s all change, except at the front where Thalita is pushing on. Jolien is still being cheered through and seems to be making some progress. At the end of the penultimate lap everyone who can see the big screen gasps as Thalita de Jong falls just by that little drop where the big tree roots are and it’s her chain that’s come off too! What a day! She seems to be unflappable, though and calmly lifts her bike to the road and works on getting that chain back in place. She seems to be taking an age and we are all concerned (well, I was) that she was going to blow it, but then we see the camera zoom in on her work and we see she’s got it in place and she’s back on. We look at where the chasers are and even after taking her time she is still 30 seconds ahead! She definitely deserves all the claps she’s getting on that last lap. 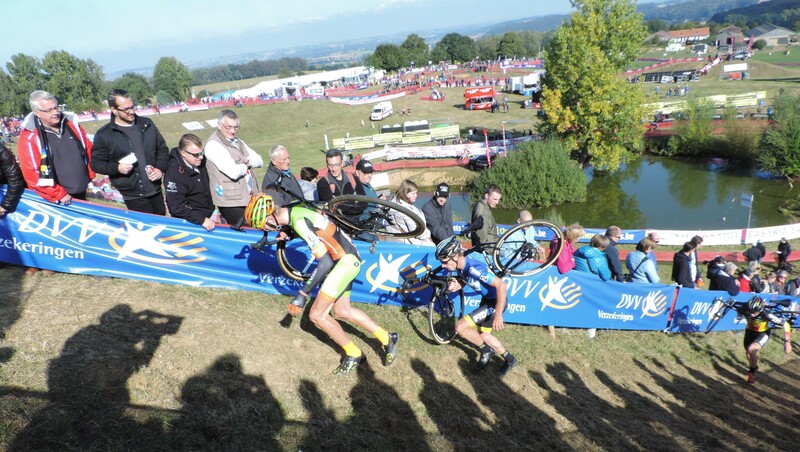 Lucinda Brand’s problem unfortunately, left her back in 5th place and Sanne Cant beat out Sophie de Boer for second. Pavla Havlikova just missed out on that podium spot today. What can the men do to beat that? It seems there was a problem for Eva Maria Palm and the medics were getting her sorted for the waiting ambulance. I don’t know what happened, but I know we all will wish her a full and fast recovery. Come back soon, Eva. While we’re waiting I get a chance for a quick pee (meaning the queue was only 5 in front of me, but only one portaloo working in that section L) and now to decide where to watch. I opt for the run-up for the first few laps so head on over there and find the same spot I had earlier. 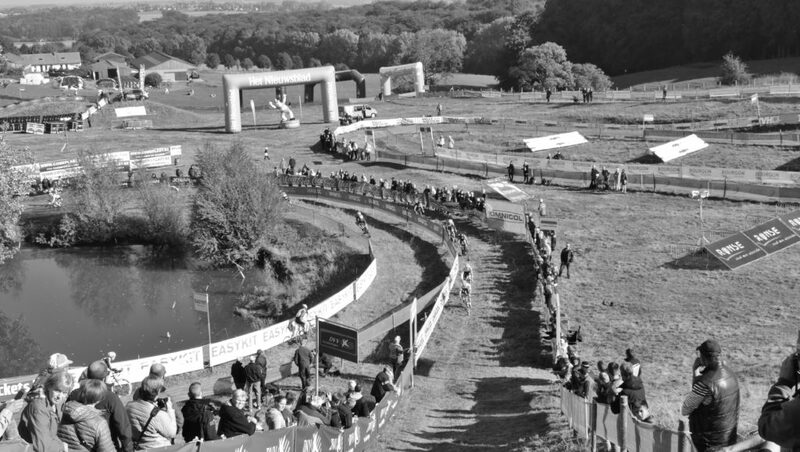 If you like a bit of drama with your bike racing, so far this year CX has it in spades! The women’s race was so much happening and so exciting the men really had to pull out all the stops. Enter Wout van Aert, Mathieu van der Poel, Michael Vanthourenhout, Tom Meeusen, Corne van Kessel, Lars van der Haar, Klaas Vantornout, Jens Adams and, of course, Kevin Pauwels. 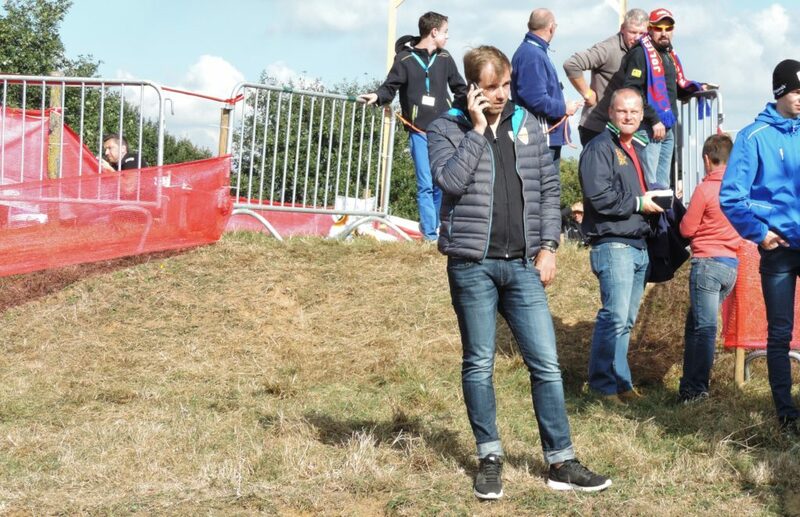 I’m not sure what the TV pictures showed you, but the mechanical problems that the women had transferred to the men – Sometimes the Belgian CX gods have a warped sense of humour. Michael’s leading, now Tom, Wout stops to fix his chain, Wout overtakes everyone on the run-up then stops to fix his chain, Wout gets back in front of Michael and tries to ride the run-up (nearly made it), Michael gets ahead and Mathieu finds his way to the front, Jens Adams and Kevin are have a battle between them behind the leaders, Wout tries to ride the run-up again (got about 2m from the top), Wout has another chain problem and now MvdP is leading and getting a gap and Wout is fighting his way back to the front, now MvdP has a problem with the pedals (!) and has to coast to the pits and once again Wout makes it back to the front. OMG! Jens moves to help Wout fight off Michael and now Kevin has to battle Lars van der Haar and chasing MvdP. For all those people who stayed away (Sven is no longer riding? 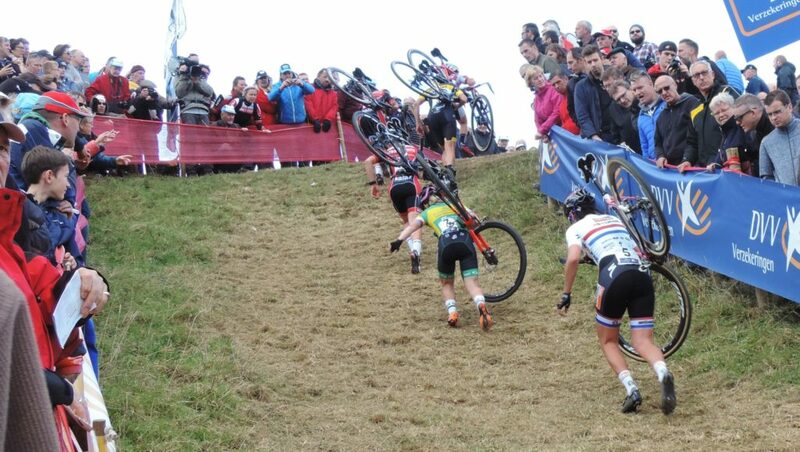 Wout will win? Etc.) you missed out on a great race. 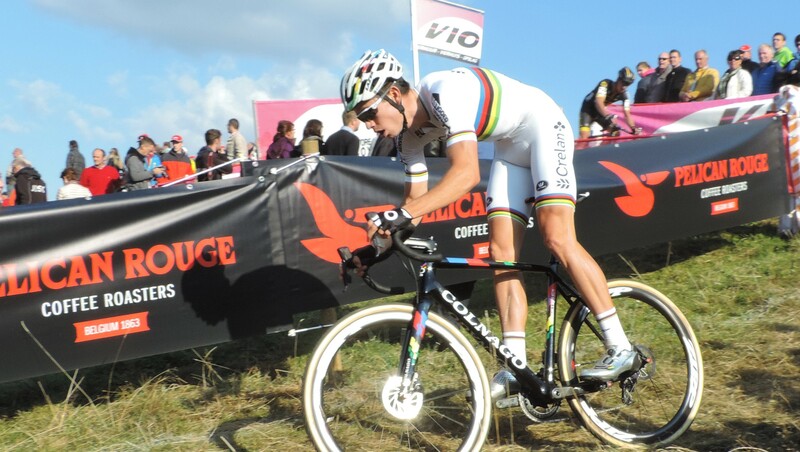 Yes, Wout did win, but he had to work very hard to get it. Jens Adams – was that his best ever result? Great ride. Michael Vanthourenhout is getting stronger – his time will come, Mathieu van der Poel – totally unpredictable mechanical failure (shades of Essen last year) and Kevin – really getting into it now, but never shouldered his bike of the run-up, what’s that about? By the end I had made it to the pit entrance and was watching them over the little hop. My vote was for Klaas, but Gianni Vermeersch gave it a go as did Dario Tielen. Due to the late start of the race there is no way we are going to make the bus by 4.30pm, but it’s a happy bunch of racegoers leaving the Hotond Arena where the CX gladiators have given their all. Next week we’re off to De Kuil for some fun in the sand.